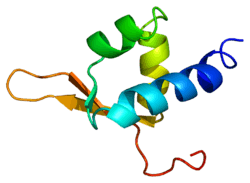 General transcription factor IIF subunit 2 is a protein that in humans is encoded by the GTF2F2 gene. GTF2F2 has been shown to interact with POLR2E and HTATSF1. ↑ Heng HH, Xiao H, Shi XM, Greenblatt J, Tsui LC (May 1994). "Genes encoding general initiation factors for RNA polymerase II transcription are dispersed in the human genome". Hum. Mol. Genet. 3 (1): 61–4. doi:10.1093/hmg/3.1.61. PMID 8162052. ↑ "Entrez Gene: GTF2F2 general transcription factor IIF, polypeptide 2, 38kDa". ↑ Wei W, Dorjsuren D, Lin Y, Qin W, Nomura T, Hayashi N, Murakami S (Apr 2001). "Direct interaction between the subunit RAP30 of transcription factor IIF (TFIIF) and RNA polymerase subunit 5, which contributes to the association between TFIIF and RNA polymerase II". J. Biol. Chem. 276 (15): 12266–73. doi:10.1074/jbc.M009634200. PMID 11278533. ↑ Kim JB, Yamaguchi Y, Wada T, Handa H, Sharp PA (Sep 1999). "Tat-SF1 protein associates with RAP30 and human SPT5 proteins". Mol. Cell. Biol. 19 (9): 5960–8. doi:10.1128/mcb.19.9.5960. PMC 84462 . PMID 10454543. Kato H, Sumimoto H, Pognonec P, Chen CH, Rosen CA, Roeder RG (1992). "HIV-1 Tat acts as a processivity factor in vitro in conjunction with cellular elongation factors". Genes Dev. 6 (4): 655–66. doi:10.1101/gad.6.4.655. PMID 1559613. Horikoshi M, Fujita H, Wang J, Takada R, Roeder RG (1991). "Nucleotide and amino acid sequence of RAP30". Nucleic Acids Res. 19 (19): 5436. doi:10.1093/nar/19.19.5436. PMC 328912 . PMID 1840667. Sopta M, Burton ZF, Greenblatt J (1989). "Structure and associated DNA-helicase activity of a general transcription initiation factor that binds to RNA polymerase II". Nature. 341 (6241): 410–4. doi:10.1038/341410a0. PMID 2477704. Sopta M, Carthew RW, Greenblatt J (1985). "Isolation of three proteins that bind to mammalian RNA polymerase II". J. Biol. Chem. 260 (18): 10353–60. PMID 3860504. Tan S, Aso T, Conaway RC, Conaway JW (1994). "Roles for both the RAP30 and RAP74 subunits of transcription factor IIF in transcription initiation and elongation by RNA polymerase II". J. Biol. Chem. 269 (41): 25684–91. PMID 7929273. Yonaha M, Aso T, Kobayashi Y, Vasavada H, Yasukochi Y, Weissman SM, Kitajima S (1993). "Domain structure of a human general transcription initiation factor, TFIIF". Nucleic Acids Res. 21 (2): 273–9. doi:10.1093/nar/21.2.273. PMC 309103 . PMID 8441635. Tang H, Sun X, Reinberg D, Ebright RH (1996). "Protein-protein interactions in eukaryotic transcription initiation: structure of the preinitiation complex". Proc. Natl. Acad. Sci. U.S.A. 93 (3): 1119–24. doi:10.1073/pnas.93.3.1119. PMC 40041 . PMID 8577725. Martin ML, Lieberman PM, Curran T (1996). "Fos-Jun dimerization promotes interaction of the basic region with TFIIE-34 and TFIIF". Mol. Cell. Biol. 16 (5): 2110–8. PMC 231198 . PMID 8628277. Fang SM, Burton ZF (1996). "RNA polymerase II-associated protein (RAP) 74 binds transcription factor (TF) IIB and blocks TFIIB-RAP30 binding". J. Biol. Chem. 271 (20): 11703–9. doi:10.1074/jbc.271.20.11703. PMID 8662660. Dubrovskaya V, Lavigne AC, Davidson I, Acker J, Staub A, Tora L (1996). "Distinct domains of hTAFII100 are required for functional interaction with transcription factor TFIIF beta (RAP30) and incorporation into the TFIID complex". EMBO J. 15 (14): 3702–12. PMC 452026 . PMID 8758937. Rowlands JC, McEwan IJ, Gustafsson JA (1996). "Trans-activation by the human aryl hydrocarbon receptor and aryl hydrocarbon receptor nuclear translocator proteins: direct interactions with basal transcription factors". Mol. Pharmacol. 50 (3): 538–48. PMID 8794892. Kojima S, Kobayashi A, Gotoh O, Ohkuma Y, Fujii-Kuriyama Y, Sogawa K (1997). "Transcriptional activation domain of human BTEB2, a GC box-binding factor". J. Biochem. 121 (2): 389–96. doi:10.1093/oxfordjournals.jbchem.a021600. PMID 9089417. McEwan IJ, Gustafsson J (1997). "Interaction of the human androgen receptor transactivation function with the general transcription factor TFIIF". Proc. Natl. Acad. Sci. U.S.A. 94 (16): 8485–90. doi:10.1073/pnas.94.16.8485. PMC 22967 . PMID 9238003. Newberry EP, Latifi T, Battaile JT, Towler DA (1997). "Structure-function analysis of Msx2-mediated transcriptional suppression". Biochemistry. 36 (34): 10451–62. doi:10.1021/bi971008x. PMID 9265625. Liang G, Hai T (1997). "Characterization of human activating transcription factor 4, a transcriptional activator that interacts with multiple domains of cAMP-responsive element-binding protein (CREB)-binding protein". J. Biol. Chem. 272 (38): 24088–95. doi:10.1074/jbc.272.38.24088. PMID 9295363. Okamoto T, Yamamoto S, Watanabe Y, Ohta T, Hanaoka F, Roeder RG, Ohkuma Y (1998). "Analysis of the role of TFIIE in transcriptional regulation through structure-function studies of the TFIIEbeta subunit". J. Biol. Chem. 273 (31): 19866–76. doi:10.1074/jbc.273.31.19866. PMID 9677423.